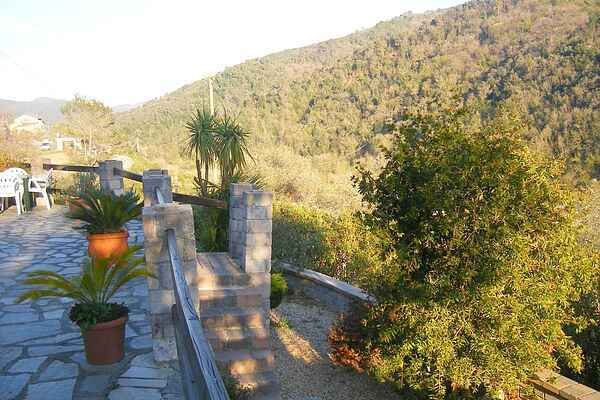 This holiday home is situated in a small village in the municipality of Stellanello. In earlier times it was a rustic mill, something you can still see in the bedrooms whose ceilings are typically oval-shaped!! A simple and rustic house, ensconced among the olive trees. It is completely surrounded by peace and tranquillity. The village of Stellanello - 400 metres away - is where one can find a restaurant, pharmacist, and a small mini-market. As for all the rest there is Andora, which is 10km away, with all amenities and beautiful open beaches. Worth visiting: Laigueglia, a typical fishing village; Alassio, an elegant town with fine beaches, typical sites, nice shops in typical "Caruggi" (alleyways); Albenga: a historical town surrounded by ancient walls, with fine shops and shopping centres. All of these localities are 15 to 20 km from Stellanello. In addition to Stellanello and Val Merula in which it is located, they offer the possibility of undertaking numerous excursions over marked trails by foot or on mountain bike, thus visiting small and ancient hamlets, and savouring typical dishes in various restaurants. In the period from June to October, the valleys hold food festivals with music and dancing!!! In Liguria, there are many cities and villages to explore, such as San Remo, famous for the Italian music festival, Imperia, Savona and a little 'further away, but worth the visit, the Cinque Terre which are part of the Unesco World Heritage. Liguria also offers beautiful beaches to spend some time relaxing in the sun! There is something for everyone. Furthermore, let us not forget that we are 50 km from France, rich in artistic venues and charming landscapes: from the Lavender fields to the typical gorges of the Verdon river, Grasse, the city of perfumes and Marseille soap, the Roja valley with its archaeological sites, and much more !!!!! The Cote d'Azur in addition to the beautiful beaches also offers rich art cities to be discovered, such as Nice, Antibes, Monaco Monte Carlo and Cannes!